Those of you who know Houston are probably aware of its rich, diverse, thriving poetry scene. We have page poets and slam poets — world champion slam poets, in fact. There’s an academic scene thanks to the Creative Writing Program at University of Houston; there’s an underground-ish (or used to be underground-ish) scene which fosters the likes of Houston Poetry Fest, a major three-day poetry festival held around town every October; there’s a mainstream blending of all of these thanks to Inprint; we have WAT (the annual seven-day Word Around Town Poetry Tour) and Meta-Four and so many others. We have readings all over the place all the time. Poetry oozes from our humid pores and swims in our flood waters. Thanks to Writers in the Schools — whose Houston chapter is decades strong and has been a flagship and model for chapters around the country — young people’s glorious verses hang on banners from our downtown lampposts and grace the marquees of our grocery stores and pop up as art installations in public parks during April. When it comes to poetry, Houston has got it going on. When I graduated from University of Houston in 1997, there were half a dozen big publishing houses in the country: the legacy houses, as traditional as publishing gets (which have now been whittled to The Big Five). At that time, there were about 57,000 small presses just in Texas, and many of them focused on poetry. One of the excellent poetry presses based here in Houston, Mutabilis Press, has been around since 2003, and they have published quite a number of truly excellent volumes. I am proud and humbled to be counted among the poets whose work has found a home in their anthologies now and then. When Sandi Stromberg, a member of the Mutabilis Press board, graciously offered one of her poems this year for this series, I jumped at the chance to feature it. focused on a distance we could never traverse. 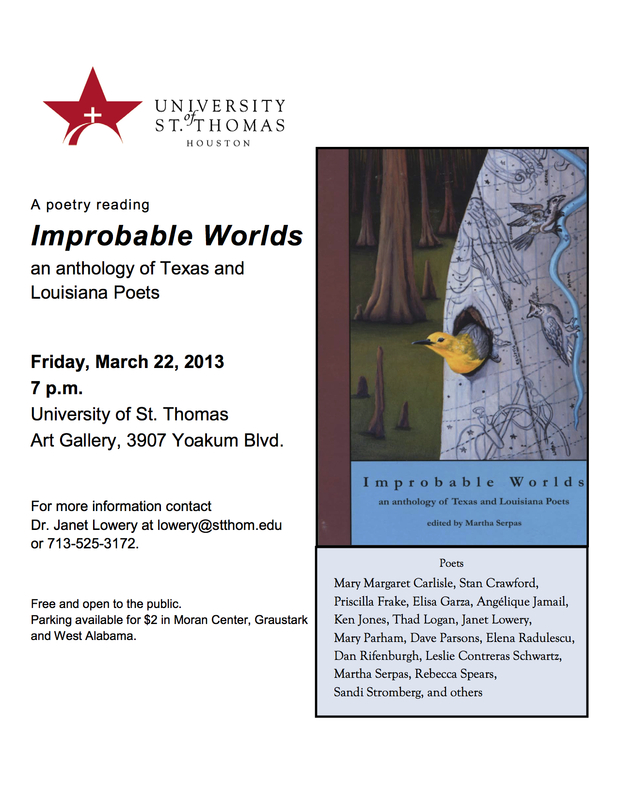 Sandi Stromberg co-edited, with Lucy Griffith, Echoes of the Cordillera (ekphrastic poems, Museum of the Big Bend 2018) and Untameable City: Poems on the Nature of Houston (Mutabilis Press, 2015). Her poetry has been nominated for a Pushcart Prize, read on PBS during the April 2017 “Voices and Verses,” and published in many journals and anthologies, including Borderlands, Illya’s Honey, Red River Review, Inprint Houston Annual Report, Texas Poetry Calendars, and three Southwest anthologies from Dos Gatos Press. She has been a juried poet nine times in the Houston Poetry Fest. Her translations of Dutch poetry were published in the U.S. and Luxembourg. You may find more examples of her published work here, here, and here. This might be my favorite OK Go song. Maybe. I know there’s nothing about it I don’t love, and there’s nothing about this video that doesn’t crack me up. And while I have your attention, I should let you know that I’m doing a reading of my poetry this Wednesday evening at Brazos Bookstore in Houston as part of the Mutabilis Press Reunion. Come see us! While the government shutdown may or may not have been inevitable, you probably knew I’d find some way to attach a haiku contest to it, especially after the 2012 Republican Primary Haiku Contest and the 2012 National Political Conventions Haiku Contest both did so well. Here’s a little refresher on what constitutes a haiku: It’s a very short poem whose origins are primarily Japanese, whose three lines are measured in syllables numbering 5-7-5, and which (as we often learn in elementary school) traditionally has something to do with nature. There are a couple of other considerations here, too, for the poetic purists. A good haiku will entertain a play between pure description and commentary on the subject matter. * Full disclosure: I’m in the book, too. This is likely the final reading for the Mutabilis Press anthology Improbable Worlds, and some of the authors featured in that book (myself included) will be reading. I feel lucky and grateful to be included among their number. It’s a fantastic anthology! If you’d like to order a copy, go to Mutabilis Press’ website for more information. If you’re in the audience, be sure to come up and say hello! I hope to see you there. I know you’re eagerly awaiting the news of who won the March Poetry Contest, but the entries are all really good, and I’m not going to be announcing the winner till this weekend. Sorry! But I do have some other exciting news. Tomorrow night — Thursday, April 5th — Brazos Bookstore will be kicking off their National Poetry Month festivities with a reception honoring and reading by several local Houston poets. The store will be featuring these authors’ books the whole month. Guess what? I’m one of them. Wheee! Come on out Thursday evening at 7:00 for the reading, and stay to buy some books and get them signed by their authors. The book I’ll have available is Barefoot on Marble: Twenty Poems, 1995-2001. I’m not sure yet what all I’ll be reading, but I suspect my selections will be from all three books (the two already published and the one I’m still working on). So Friday night I went to a book launch reception and a spontaneous poetry reading broke out. This was the Mutabilis Press event for Improbable Worlds. It was a lot of fun catching up with old friends I hadn’t seen in a while. I was pleased to see some of my students out there, too; it’s nice to provide a little real-world context for what we do in the classroom. And I admit I like it when they have a chance to see me as an author and not just as a teacher. Even though this is no doubt all in my imagination, I get the sense this lends me a little more street cred come Monday morning and I’m back behind the podium. I had really wanted my children to come to the event, too, but it just wasn’t practical. It’s actually more important to me that my kids see me out in the world being an author, so that they can have some context for when I have to tell them I can’t take them somewhere or play with them or sit and watch cartoons all Saturday morning because I have to go to a writing date or a writers’ group meeting or poetry reading. But taking them to The Jung Center this past Friday night just wasn’t practical. Ah well, someday. In the meantime, here’s a quick little poem I wrote a while back (speaking of my kids). It started off as an exercise, but it turned into something, sort of. A Hand-Drawn Card from the Girl Who Does Know Better But. I am the girl who does know better but. I am desperate for your attention. I am apologizing for pushing the little brother in the yard. I am planning the next push anyway. I am pulling the long hairs of the cat when your back is turned. I am shouting a song to the sleeping baby while you nap. I am offering the hamster a fruit snack. I am changing clothes a dozen times a day. I am adding extra sugar to the lemonade when you are not looking. I am wishing you had brought me to school a little early so I could play. I am wishing you had ironed my clean dress. I am insisting I can brush my hair myself. I am happier when you brush my hair for me. I am asking you five times a night for one more bedtime song. I am breaking and entering in your nail polish drawer. I am impatient to grow tall enough to build my own sandwich. I am asking for potato chips for breakfast. I am sad when you go to your party. I am trying to learn how to read. I am pushing the little brother off the couch. I am waking you up with kisses. I am loving you, loving you, loving you. I am trying to be patient for my sixth birthday. I am plunging my face into the bowl of cake batter. I am waiting for you to giggle with me. I am looking like you every day. I am turning into a little lady. I am hoping you’ll take me to tea in my new hat. I am five and loving you so much.